At a time when two fastest growing economies of the world find place in Asia and the first world keeps eyeing on the huge opportunities available in these two economies because of its size and scope (potential) Ruchir Sharma (head of Emerging Market Equities and Global Macro at Morgan Stanley Investment Management) brings this book concentrating on the emerging markets in the title of ‘Breakout Nations'. As visible, Indian economy is facing a tough time from the point of view of the perception of foreign investors and the climate that is created by policy makers; this book makes a mark through identifying eleven developing economies of the world and tracing their development path. These eleven economies include Mexico (from Latin America), Hungary and Poland (from Eastern Europe), Egypt and South Africa (from Middle East & Africa), and India, China, Thailand, Indonesia, Malaysia, and Sri Lanka (from Asia). 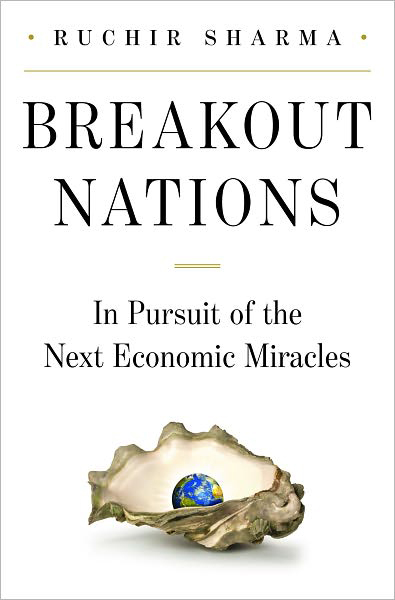 As discussed in the book these countries are going to break out and are going to play an important role in the world economies. These emerging economies are filtered out from the universe of around 50 nations of different continents. The author presents the cases very lucidly with the support of narratives and strong data in order to make a convincing defense. The problems of business operations in these economies are spelled out through many examples based on the practices and experiences of the author himself as he ‘generally spends one week per month in a developing country somewhere in the world’. This book is basically an Economic Travelogue which takes the reader along with the author to visit the emerging places so far as economic development is concerned. Ruchir feels that the views of the west about Goldman Sach's developed acronym for Brazil, Russia, India, China and South Africa as BRICS is an exaggeration as except in case of China, other countries have very little trade with each other. The warning signals and the problems as to crony capitalism, entry barriers, concentration on city based development (urban centric), political interference, perceptual mapping etc are nicely put forth by the author in the book. Until these nations put their houses in order it might be really difficult for them to positively derive benefits from such capital movement. The book is written in a very engaging and authoritative style. I have no hesitation in saying that it is an unprecedented account of the developing economies supported with excellent experiences, narratives and thoughtful comparisons based on growth parameters.